The event will feature a keynote address by Ellen P. Goodman of the FCC’s Future of Media team. Ellen is one of the sharpest minds in the media policy universe today, and a real asset to the FCC team. She is a Distinguished Visiting Scholar at the FCC, a Research Fellow at American University’s Center for Social Media, and a Visiting Scholar at the University of Pennsylvania’s Annenberg School of Communications. She is also a Professor at Rutgers University School of Law at Camden, specializing in information law and policy. She has spoken before a wide range of audiences around the world on media policy issues, has consulted with the U.S. government on communications policy, and served as an advisor to President Obama’s presidential campaign and transition team. After Ellen Goodman brings us up to speed with where the FCC’s Future of Media process stands, we’ll hear from a diverse panel of experts that I am still busy assembling. But so far it includes Charlie Firestone of the Aspen Institute, who will be on hand to discuss the work he’s been doing with the Knight Commission on this front. I’ve also invited a rep from the Newspaper Association of America to come and talk about the diversity of new media monetization models that they have been aggregating. (Check out the appendix of their outstanding FTC filing last Nov.) And Kurt Wimmer of Covington & Burling, who represents broadcasters among others, will talk about the need for regulatory flexibility / forbearance, especially on ownership issues. Again, more panelists to come. But please sign up now! PFF today released the fifth installment in our ongoing series on “The Wrong Way to Reinvent Media.” This series of papers explores various tax and regulatory proposals that would have government play an expanded role in supporting the press, journalism, or other media content. In the latest essay, Berin Szoka, Ken Ferree, and I discuss proposals for direct subsidies for failing media outlets and out-of-work journalists. The ideas within these and other essays in the series will be worked into a major PFF filing in the Federal Communications Commission’s (FCC) proceeding on the “Future of Media” on May 7. The paper may be viewed online here and I’ve attached it down below in a Scribd reader. In this latest PFF TechCast, Berin Szoka and I discuss the two latest installments in our ongoing “Wrong Way to Reinvent Media” series. These two recent installments dealt with “media vouchers” and expanded postal subsidies as methods of assisting struggling media enterprises or promoting more hard news. In this 7-minute podcast, PFF’s press director Mike Wendy chats with us about these proposals and we argue that they both raise a variety of practical and principled concerns that weigh against their adoption by policymakers. As mentioned here before, PFF has been rolling out a new series of essays examining proposals that would have the government play a greater role in sustaining struggling media enterprises, “saving journalism,” or promoting more “public interest” content. We’re releasing these as we get ready to submit a big filing in the FCC’s “Future of Media” proceeding (deadline is May 7th). Here’s a podcast Berin Szoka and I did providing an overview of the series and what the FCC is up to. In our latest essay, “The Wrong Way to Reinvent Media, Part 4: Expanding Postal Subsidies,” Berin and I argue that expanding postal subsidies won’t likely do much to help failing media enterprises, will raise the risk of greater meddling by politicians with the press, and can’t be absorbed by the Postal Service without a significant increase in cost for ratepayers or taxpayers. The entire essay is attached down below. As I’ve mentioned here previously, PFF has been rolling out a new series of essays examining proposals that would have the government play a greater role in sustaining struggling media enterprises, “saving journalism,” or promoting more “public interest” content. We’re releasing these as we get ready to submit a big filing in the FCC’s “Future of Media” proceeding (deadline is May 7th). Here’s a podcast Berin Szoka and I did providing an overview of the series and what the FCC is doing. In the first installment of the series, Berin and I critiqued an old idea that’s suddenly gained new currency: taxing media devices or distribution systems to fund media content. In the second installment, I took a hard look at proposals to impose fees on broadcast spectrum licenses and channeling the proceeds to a “public square channel” or some other type of public media or “public interest” content. In our latest essay, “The Wrong Way to Reinvent Media, Part 3: Media Vouchers,” Berin and I consider whether it is possible to steer citizens toward so-called “hard news” and get them to financially support it through the use of “news vouchers” or “public interest vouchers”? We argue that using the tax code to “nudge” people to support media — while less problematic than direct subsidies for the press — will likely raise serious issues regarding eligibility and be prone to political meddling. Moreover, it’s unlikely the scheme will actually encourage people to direct more resources to hard news but instead just become a method of subsidizing other content they already consume. I’ve attached the entire essay down below. 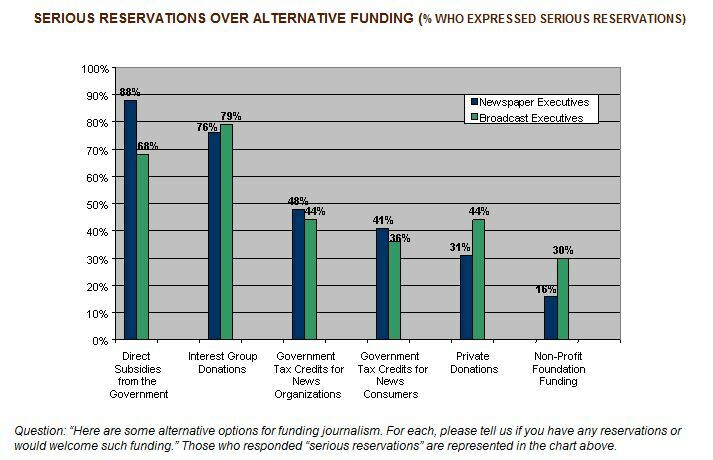 Good to see so many media industry executives expressing skepticism about the idea of government subsidies for the press. Danny Glover brought to my attention this new survey by the Pew Research Center’s Project for Excellence in Journalism in association with the American Society of News Editors (ASNE) and the Radio Television Digital News Association (RTDNA). It revealed that, “Fully 75% of all news executives surveyed—and 88% of newspaper executives—said they had ‘serious reservations,’ or the highest level of concern, about direct subsidies from the government.” A smaller percentage (only 46%) had serious reservations about tax credits for news organizations, then again, only 13% said they “would welcome such funding” and just 6% said they were “enthusiastic” about it. This is encouraging news as many government officials at the FCC, FTC, and in Congress are currently considering whether government should steps to prop up failing media entities or promote certainly types of content. Berin Szoka and I have been working on a series of essays about the wrong ways to go about reinventing media [see Part 1, Part 2] and plan several more installments leading up to a big filing in the FCC’s “Future of Media” proceeding (the deadline is May 7th). In the latest PFF TechCast, I discuss the issues considered in the second essay in our ongoing series, “The Wrong Way to Reinvent Media.” In this 6-minute podcast, PFF’s press director Mike Wendy chats with me about proposals to impose taxes on broadcast spectrum licenses to funnel money to public media or “public interest” content. In my paper and this podcast, I make the case again socially engineering media choices and outcomes through the tax code. As mentioned last week, in a new series of essays, PFF scholars will be examining proposals that would have the government play a greater role in sustaining struggling media enterprises, “saving journalism,” or promoting more “public interest” content. With many traditional media operators struggling, and questions being raised about how journalism in particular will be supported in the future, Washington policymakers are currently considering what role government can and should play in helping media providers reinvent themselves in the face of tumultuous technological change wrought by the Digital Revolution. We will be releasing 6 or 7 essays on this topic leading up to our big filing in the FCC’s “Future of Media” proceeding (deadline is May 7th). And here’s a podcast Berin Szoka and I did providing an overview of the series. In the first installment of the series, Berin and I critiqued an old idea that’s suddenly gained new currency: taxing media devices or distribution systems to fund media content. In the second installment, “The Wrong Way to Reinvent Media, Part 2: Broadcast Spectrum Taxes to Subsidize Public Media,” I discuss proposals to impose a tax on broadcast spectrum licenses to funnel money to public media projects or other “public interest” content or objectives. Such a tax would be fundamentally unfair to broadcasters, who are struggling for their very survival in the midst of unprecedented marketplace turmoil. Moreover, such a tax is unnecessary in light of the many other sources of “public interest” programming available today. Finally, even if the government creates or subsidizes wonderful, civic- and culturally-enriching content, there’s no way to force people to consume it. Nor should government force such media choices upon the public. There’s no good reason for government to be socially-engineering media choices through taxes. PFF recently started a new “TechCast” podcast series and the topic for one of our first episodes was about the new series of essays that we have coming out about “The Wrong Way to Reinvent Media.” In this series, we’re examining proposals that would have the government play a greater role in sustaining struggling media enterprises, “saving journalism,” or promoting more “public interest” content. We’re concerned about the prospect of central planning for media or a “public option” for the press. Once the federal government starts subsidizing our own free press, how long until the feds start revoking broadcast licenses of government opponents and bringing pesky reporters up on charges of say, “corruption” or “subversion”? According to McChesney and the Free Press folks, it apparently can’t happen soon enough.